If you’ve read any Mac-related Web sites over the past few weeks, you’ve surely seen more than a few complaints about Stacks, Leopard’s new feature that lets you put a folder in the Dock and then see a graphical display of that folder’s contents by clicking on it. The idea behind Stacks is to provide fast, visually-enhanced access to files in a folder. By letting you view icon previews of those files via a single click, Stacks makes it easy to open a file without having to dig through the Finder to locate it. However, as many Macworld editors —not to mention Macworld readers —have noted, Stacks is not all peaches and roses. It has a number of interface issues, and it’s missing one of the most useful features of the folder-in-the-Dock functionality of older versions of Mac OS X. Now that I’ve used the release version of Leopard for a few weeks, here’s my take on what’s good and bad about Stacks. I also suggest some minor changes Apple could make to Stacks that would increase its appeal among fans and critics alike. 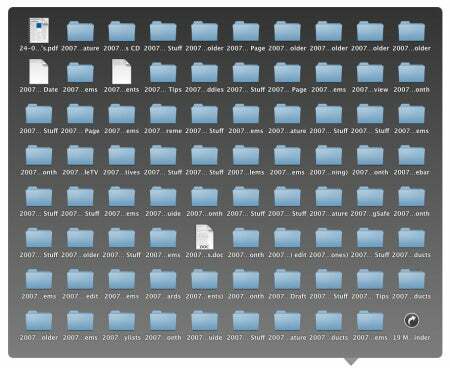 You can view a folder’s contents with a single click: There’s no Control-click, right-click, or click-and-hold needed. 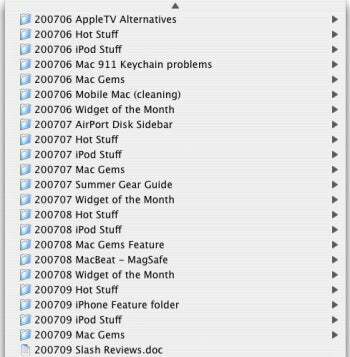 You can choose how a stack’s contents are sorted: In older versions of Mac OS X, I always wanted to be able to sort, by date, the Dock’s display of a folder’s contents. You can grab-and-drag a file from within a stack display: For example, you can easily drag that file to an application icon in the Dock, to the Trash, to another folder, or to the Desktop. You can spot files at a glance: If you don’t know a file’s name, but you know what it looks like—for example, a particular image in a folder of images—Stacks’ document previews make it easier to find the file compared to Tiger’s approach (which displayed item names next to tiny icons). For the visually-oriented, this is a nice improvement. Even the harshest critics of Stacks have to admit there’s some good to be found here; I especially like the middle two items, which are features many people asked for in older versions of OS X. You lose hierarchical menus: With previous versions of the Dock, right-clicking (or Control-clicking or click-holding) on a folder presented you with a fully-navigable, hierarchical menu of the folder’s contents. A stack shows you only what’s at the top level of that folder; to go any further—for example, to see what’s inside a subfolder—you must open the folder in the Finder and then browse its contents using Finder windows. This is easily the most common complaint we’ve heard from readers about Stacks. Stacks’ Dock icons are inconsistent: When you place a folder in the Dock, its icon changes to reflect the “first” item in the stack; depending on how you’ve opted to sort the stack display, this will be either the first item alphabetically, the first item of a particular kind of file, the most-recently-created file, or the most-recently-modified file. Although this approach may be useful for particular folders—for example, the Downloads folder, where the most-recently-downloaded file is often what you’re most likely to access—for many folders it’s a step back in user-interface design. How so? One of the bedrocks of a good interface is consistency, which helps the user develop visual and muscle memory that increase efficiency and make software easier to use. For example, in my Tiger Dock, I’ve applied custom icons to all the folders so a quick glance tells me which is which. In Leopard, the icons of folders in the Dock change regularly, so I can’t memorize each folder’s position by its icon; I have to move the mouse cursor over each stack to view its name. And the irony here is that the more you take advantage of Stacks—in other words, the more folders you place in the Dock—the more effort it takes to figure out which folder is which. Stacks may not display all files: There’s a limit to the number of files that can appear in a stack’s display. If you’ve got a folder with lots of items, you simply can’t view them all; you have to open the folder in the Finder and browse it there, which defeats the purpose of Stacks. With older versions of the Dock, the menu would scroll to let you view everything in the folder. Grid view breaks down: Grid view is supposed to improve Stacks’ usability when a stack includes many files, but in some ways it’s less usable than fan view. For instance, it isn’t as easy to navigate as fan view, because files are sorted across rows. (This may seem like a minor complaint, but after trying to find a particular text document in a folder of 40, I really wanted my hierarchical list back.) As another example, longer file names are truncated, making it difficult to find the desired file; you have to manually mouse over each truncated filename to view the full name. …or this hierarchical list from OS X 10.4? Stacks handles empty folders differently: If a stack’s folder is empty, clicking on it opens the folder in the Finder instead of displaying a stack. (Well, OK, so I guess there is indeed a way to open a folder by clicking on it in the Dock: don’t put anything in the folder . I kid.) This inconsistency is confusing, especially given that Stacks is aimed at non-advanced users. If we’re stuck with Stacks, the stack display should appear 100 percent of the time; if a folder is empty, the stack display should say that. It seems clear that while Stacks offers some benefits, it’s also far from perfect. In addition, in the process of adding Stacks to Leopard, Apple removed a feature that was very popular with many OS X users. To paraphrase a member of the Macworld forums, Stacks replaces something useful with something that’s more attractive but, in many ways, less useful. Another simple improvement would be to let the user choose—via a similar setting in a stack’s options menu—a stack’s Dock icon: the actual folder icon, a generic icon, or the current “determined-on-the-fly” icon. Finally, to improve the overall interface consistency of Stacks, I’d like the ability to choose default viewing options (the stack display style and its Dock icon) for new stacks. These options could be simple checkboxes or pop-up menus in Dock or Finder preferences, and the user could override the default settings for a particular stack using the existing options menu. These aren’t major changes and—perhaps most appealing to Apple and to those who like Stacks the way it is—they wouldn’t affect Stacks’ current behavior unless you actively changed your settings. Let’s hope Apple agrees and turns Stacks into something for everyone.